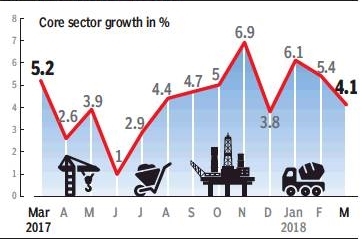 Growth in eight key infrastructure segments slowed to a three-month low in March, dragged down by sluggish output from crude oil, natural gas, refinery products and fertiliser sectors. The eight core sectors spanning coal, steel, cement, electricity, crude oil, natural gas, refinery products and fertiliser grew an annual 4.1% in March, slower than previous month’s 5.4% and lower than 5.2% in March 2017. Growth in the sector for 2017-18 was 4.2%, slower than 4.8% posted in the year-earlier period. The eight core sectors account for 40.3% of the index of industrial production and serve as an advance indicator of the performance of industrial output data to be released later in the month. Crude oil output contracted 1.6% during March, while natural gas grew an annual 1.3%. Refinery products rose 1%, while fertiliser sector grew 3.2%. The coal sector rose a robust 9.1%, while the cement sector increased 13% in March. The steel sector grew 4.7% and electricity rose 4.5%.